I like using Facebook to keep tabs on my friends, but I don't like the endless stream of "so-and-so took this quiz" and "Joe became friends with Jane" messages. 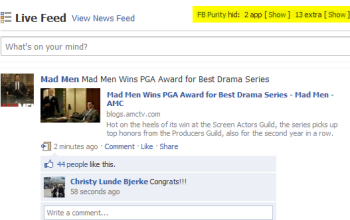 I just became a fan of Facebook Purity, an add-on that removes those notifications from your Facebook home page. Facebook Purity is a script that requires Greasemonkey. Once you've installed that and restarted Firefox, just install the FP script, start up Firefox again, and fire up Facebook. The effects are subtle--don't expect a major makeover--but definitely worthwhile. You may not notice any immediate changes, but you should see a "FB Purity hid" header like the one highlighted in this screen shot. The tally refers to the number of Facebook apps and "extras" hidden from your home page. If you're curious to see what they are, just click Show for either category. By the way, Facebook Purity is compatible with Google Chrome, Opera, and Safari, but using Greasemonkey scripts with those browsers is a bit more complicated. Again, see the FAQ page for details. For a service as photo-oriented as Facebook, the simple act of downloading photos is annoyingly complicated. In fact, there is no download option; you have to view each photo in turn, right-click it, and choose Save Image As or Save Picture As (depending on your browser). So what happens if a friend posts a bunch of pictures you want to download? Are you really supposed to go through and save them one by one? Not if you install the FacePAD plug-in for Firefox. Short for Facebook Photo Album Downloader, it does exactly what its name implies: downloads entire albums at a time. After loading the plug-in and restarting Firefox, select Tools, Add-ons, find FacePAD, click Options, and choose your language. Click OK and you're good to go. 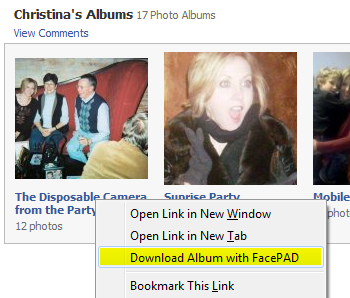 To use FacePAD, just navigate your way into a friend's photo library, right-click an album link, and choose Download Album with FacePAD. In a matter of minutes the plug-in will plunk every photo into your default Firefox Downloads folder. It's too bad you can't specify a folder or do any batch-renaming; all the photos end up with cryptic numerical file names. Still, FacePAD works as advertised, and it's a damn sight easier than retrieving each photo manually. Let's solve another Facebook hassle: When you leave the site, your chat sessions get left behind. Wouldn't it be nice if you could keep a Facebook chat going regardless of what site you're viewing? In Firefox, press Ctrl-B to open the Sidebar in Bookmarks view. 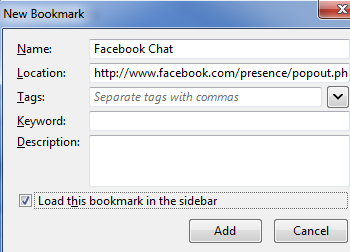 Right-click the bookmark folder where you want to add Facebook chat, then choose New Bookmark. Check "Load this bookmark in the sidebar," then click OK.
Now just click your new bookmark and presto: Facebook chat in the sidebar. Not too shabby, eh? Brizzly provides a clean, simple, ad-free interface for Facebook (Twitter, too). Getting started with this free Web service is a snap. Sign up for an account, then supply your user name and password for Facebook and/or Twitter. You'll have to click through a couple "approval" pop-ups, which is normal for any outside service seeking access to your account. Now you've got a simple front end for your Facebook news feed. You can update your status, comment on friends' posts, watch posted videos, write on walls, and so on. You don't get every single Facebook feature--you can't "hide" a friend or play any games--but you do get a refreshingly streamlined interface.